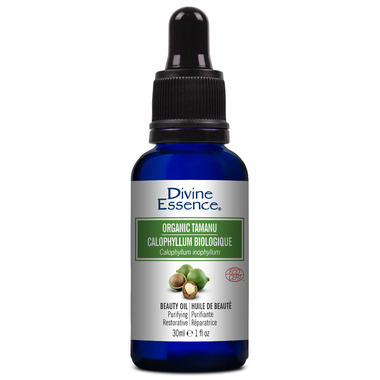 Divine Essence Organic Tamanu Oil has a fragrant and nutty aroma. It is a great skin care oil and can be used as a nourishing hair dressing. I'm new to using this oil. I got it for a few very superficial blemishes on my face. I read the other reviews before I got it and I was expecting it to not smell that great but I actually don't mind the smell. It kind of reminds me of south asian dishes which might be an acquired smell for some. I like that the consistency is a little thick. Can't wait to see the results! it has very strong scent but I get used to it after couple of days. I don't like the smell honestly but it is so effective in healing my acne and helps fade scars so I will still continue to use it. It works after a week of using this product. A little goes a long way. I will take 2 drops and tap it on my face. do not rub. I use this day and night. My face is bright and refresh and not oily the next morning. Although I hate the smell, I will definitely buy this product again. very strong scent. It made me gag at first. I had to remind myself that it was just a strong nut scent for the first week I used it since I was using it on my face. I've become accustomed to the scent now and quite enjoy adding it to my skincare routine. Excellent ! pour le cernes et la couperose.